Last session Thursday 19th December 2019 followed by party. at the Weoley castle dojo. Re-opens Staurday 4th January 2020 at the Longbridge dojo. 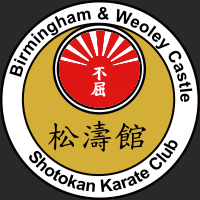 Unless stated otherwise, gradings start at 6pm at Longbridge Methodist church. Please remember to ask Sensei Hession for permission to grade and if you require a new belt, let her know your name, belt colour and size. Please also make sure that your license is up-to-date, as without a valid licence, you will not be able to grade.